TYPE: Evergreen vine that will easily train itself to a trellis or fence. If left unsupported, it will twine on itself to produce a mounding shrub or even a groundcover. HABIT: 2-4 inch clusters of yellow or orange blooms from April to September. 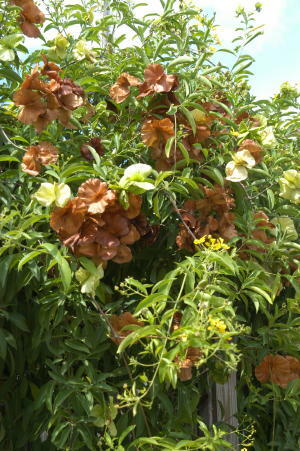 ​Butterfly vine does well in north Texas and is best adapted to zones 8-10. CULTURE: Relatively easy to grow in any soil. Slow-growing. Does not grow well in pots. USES: Summer color to attract butterflies. PROBLEMS: Aphids on new growth. Can die out from too much water. Hard to transplant. NOTES: Plant a few, but don’t invest a lot of money in this plant.